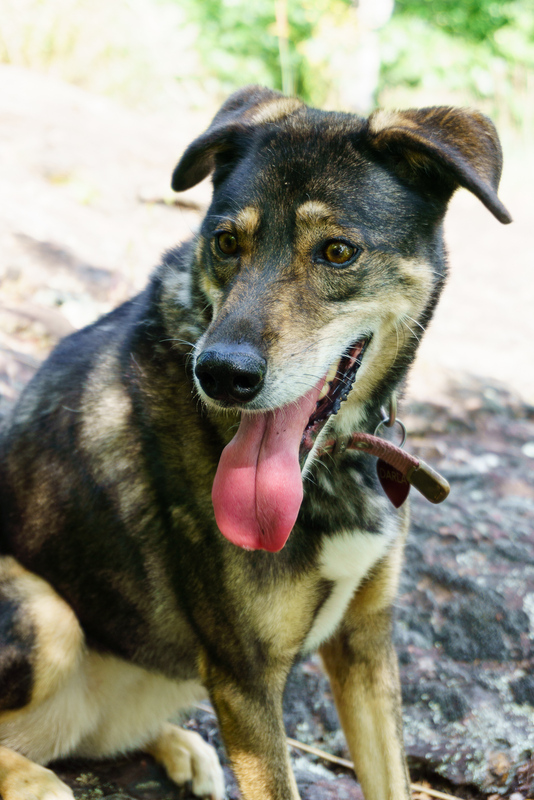 On Sunday, September 6, I took Darla the Trail Dog out for a hike in the Pisgah National Forest near the Pisgah Inn on the Blue Ridge Parkway. We were looking for a moderate-length hike due to time restrictions, and since the relentless heat we’d been experiencing in late summer hadn’t let up at all, I wanted to head for the higher elevations. So I chose to explore a small section of trail I’d never actually completed: the short section of Pilot Rock Trail from the Mountains to Sea Trail down to where it joins the Thompson Creek Trail. I decided to include that segment as part of a longer loop, including some trails I’d already done. The parking area at the Pisgah Inn was packed. I thought about going back to the Mount Pisgah parking area, but that’s where we’d stopped to eat lunch and I knew it was packed too. We managed to find a free spot near the back of the lot, and headed north up the Mountains to Sea Trail, which begins up a set of steps and water bars past the employee housing for the Pisgah Inn. Imagine having access to this trail right out your door! I lived in a similar situation on Mt. Mitchell back in 2001, and back-door trail access was indeed a pretty neat perk for the job. 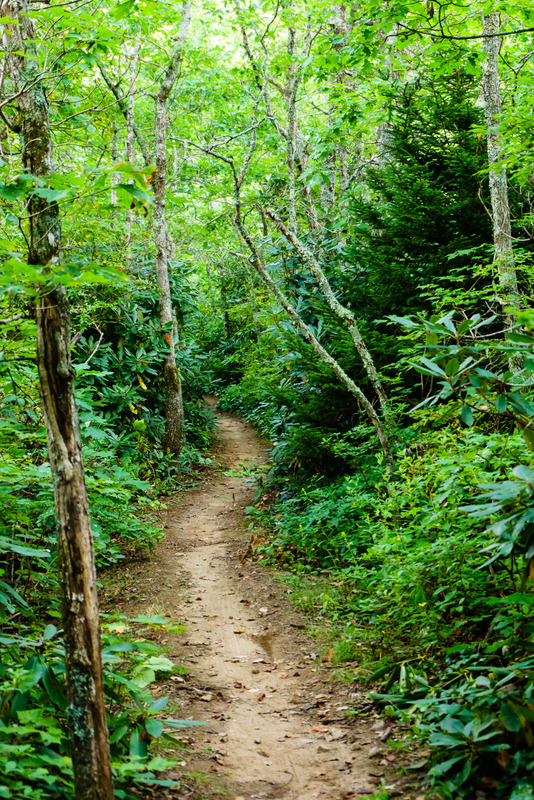 The trail winds along the ridge connecting Little Bald Mountain to Flat Laurel Gap, where the Pisgah Inn is located, on gentle grades. It passes some openings in the trees that provide views to the East at one point, and a clearing at another where wildflowers grow. The forest is mostly northern Hardwoods, with a few Red Spruce thrown in for good measure. 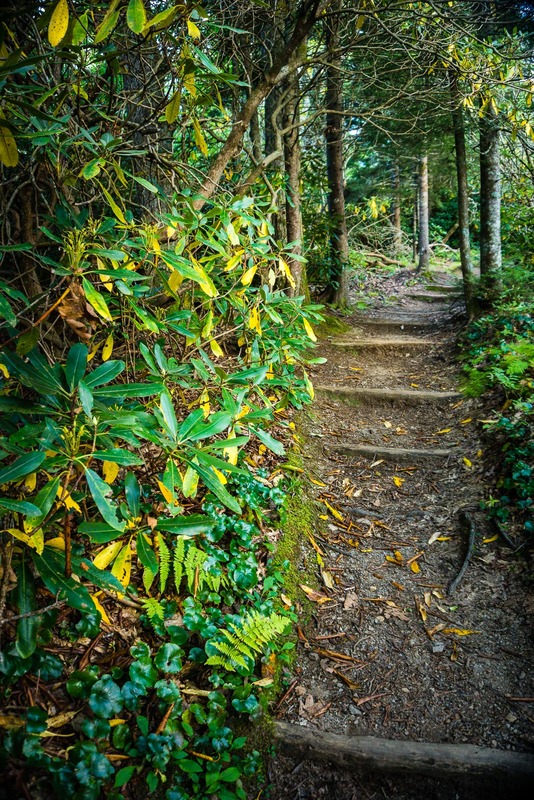 The Mountains to Sea Trail stretches from the Smokies to the sand dunes in Jockey’s Ridge State Park. I only hiked a tiny portion of the trail today. We soon reached the turn-off to the southeast for the Pilot Rock Trail, which begins by ascending to the summit of Little Bald Mountain. From here to the Thompson Creek Trail intersection, I was hiking the path for my first time. And it’s a neat stretch of trail. 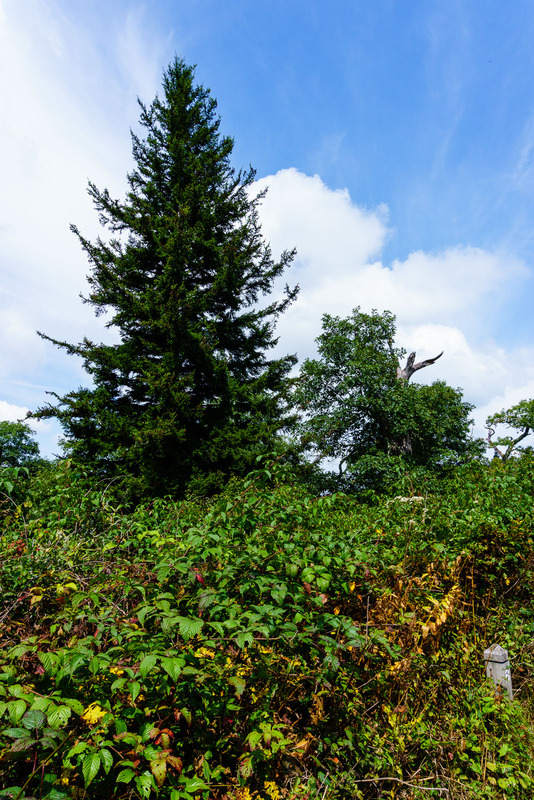 First, the spruces gave way to grassy openings and more northern hardwood forests as we crossed the summit and started the descent. There were a couple of switchbacks, and the trail passed through a dead stand of beech trees where some other folks were hanging out and enjoying the resulting view. 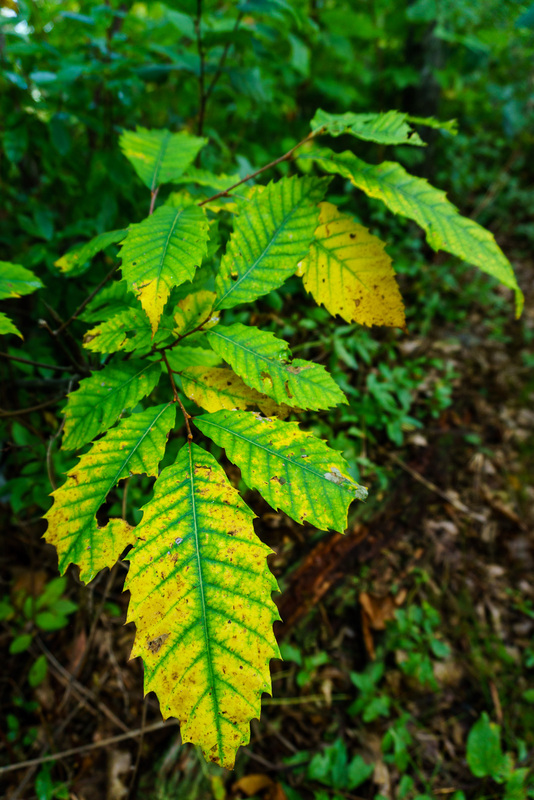 Just beyond that, I found a small American Chestnut sprout that was sporting one of the earliest signs of fall, and I couldn’t help but to snap a picture. The trail was on the ridge in places, and just off to either side in others. Rock outcrops loom above the trail in places, while ferns growing under the trees and amongst the grass were waving in the breeze. I’m definitely glad I decided to check it out. It wasn’t long, however, before we reached the Thompson Creek Trail junction, so that was that – from here on out I’d be on trails I already knew. Nevertheless, I’m glad I knocked this fun little stretch of trail off my list. Darla the Trail Dog bounded a short way down Thompson Creek as I stopped to snap another picture of the trail sign, but had to beat a hasty retreat when she saw me going farther down Pilot Rock toward the Laurel Mountain Connector instead. Ridge-top Pilot Rock Trail, looking southeast from the Laurel Mountain Connector junction. A lone Red Spruce tree on the right is still there. I first noticed it when it was about head high, on a mountain bike ride in the 90's. At the junction with Laurel Mountain Connector, the ridge widens out. We continued straight, onto the out-and-back portion of the hike. There is one Red Spruce tree here, which has grown quite a bit since I first noticed it (it was head-high at the time) on a mountain bike ride back in the 90’s. 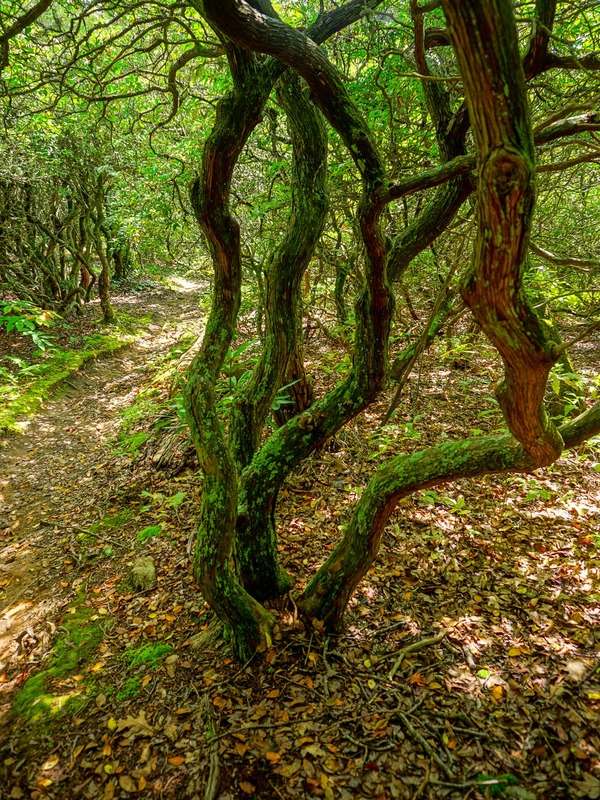 The trail follows the ridge pretty closely, through thickets of gnarly, twisted mountain laurel bushes. 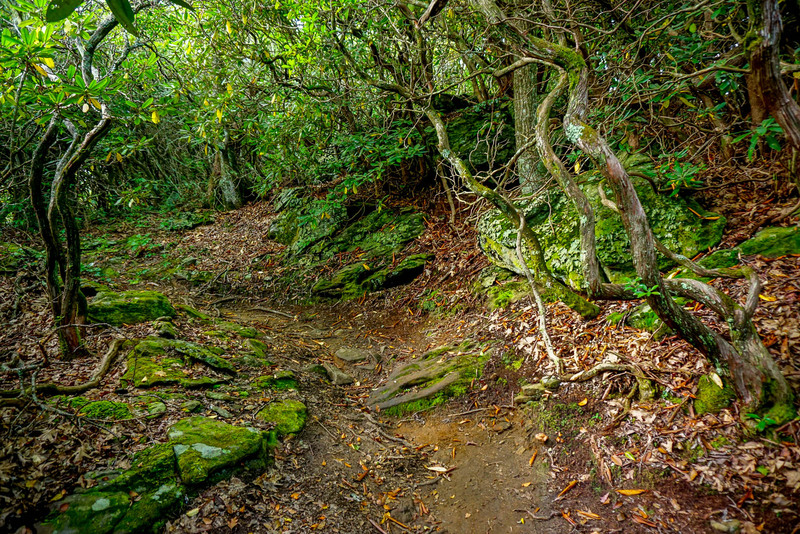 And that’s how it goes for quite a distance along the ridge – winding around with some stretches steeper than others, but that ever-present mountain laurel draped with hanging moss on all sides. As you descend, the forest only gradually changes, and some taller trees mix in. The air was also becoming noticeably warmer, too, as we popped out of the trees into a clearing around a rock outcrop located right beside the trail. The trail actually appears to be carved into this rock at one point, and just below it is a well-engineered switchback, built up with dry-stack stone walls and cobblestone fill. Unfortunately, there’s not much of a view from this one. Darla stopped for a bit to let me take a picture of her sitting on the rock, and lapped up some water I poured into a depression from my reservoir. Just beyond the first outcrop on the right, a side trail descends to another outcrop with a nice view toward the Pink Beds area and the mountains beyond. Although Pilot Rock itself – which arguably has a better view – was still a short distance down the trail, it was starting to get downright hot, and I wanted to have plenty of time to get home for dinner. So the closer outcrop was the destination for this hike. We explored the upper side of the rock outcrop, enjoying the view and the breeze that had developed as we popped out of the trees. I noticed a (pretty big) rattlesnake skin near a free slab of rock at the edge of the woods. Good thing it’d moved on by the time we got there – although there’s no telling how far away it was, or if there were any more. Luckily, we didn’t encounter any. After some time soaking up the scenery, we backtracked back up the ridge to the Laurel Mountain Connector, onto which we made a right turn. This trail descends gently in this direction. The forest here is different, with larger trees and some small, gnarly, yet old surviving American Chestnuts. 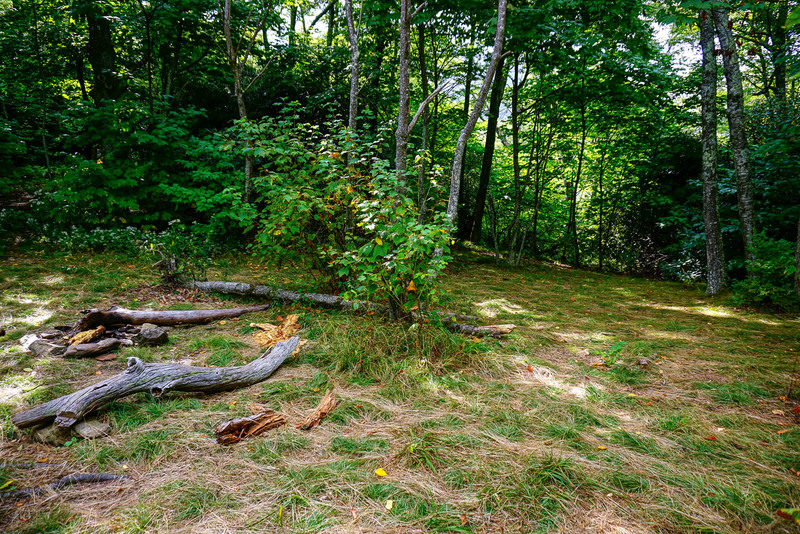 The connector is short, and upon reaching Laurel Mountain Trail it goes through a switchback before popping out at what has to be one of the finest campsites in the area, located in Turkey Spring Gap. It’s level and grassy, somewhat protected from the elements yet high up enough to remain cooler in the summer. Just up the Laurel Mountain Trail is a pretty good water source, which was still running even after a few months of drought during the warm season. (And judging by the name there may be a Turkey Spring nearby, I haven’t investigated). There is room enough for several tents or tarps. After exploring the campsite for a bit, we headed up the Laurel Mountain Trail toward the Parkway. 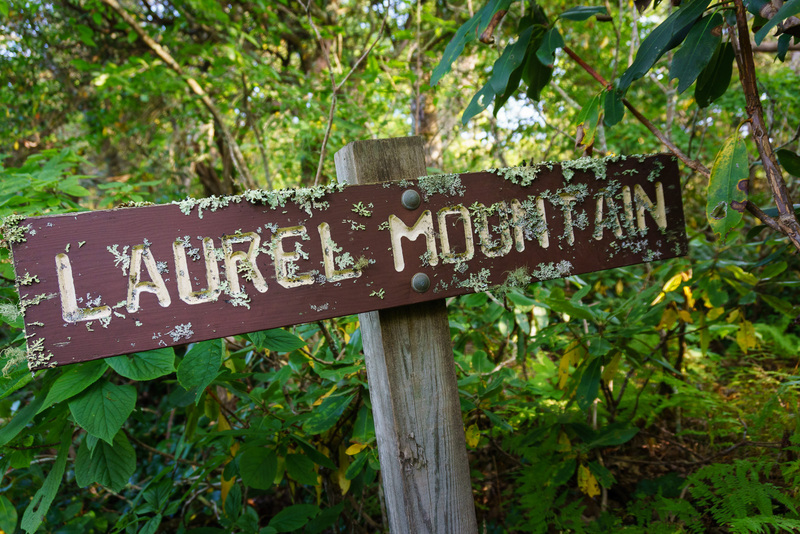 Unlike the Pilot Rock Trail which is up at the top of the ridge, Laurel Mountain is down on the north slope, and it is much wetter. There is the potential water source for the campsite I mentioned, plus several other springs/seeps which flow way beneath the trail – which is built up high on rock wall cribbing in many sections. The trail surface is still moderately rough, but not nearly as much as it would be if these massive rock walls hadn’t been built. 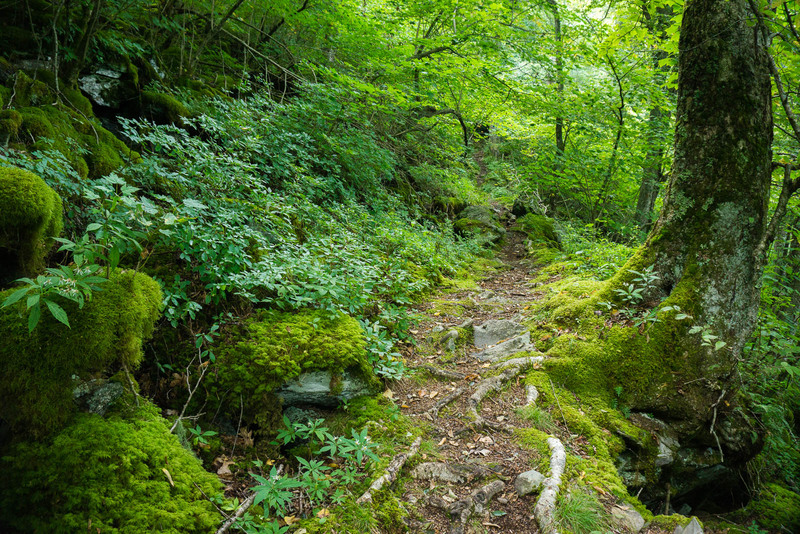 Everything on this stretch is covered in a thick layer of deep green moss. 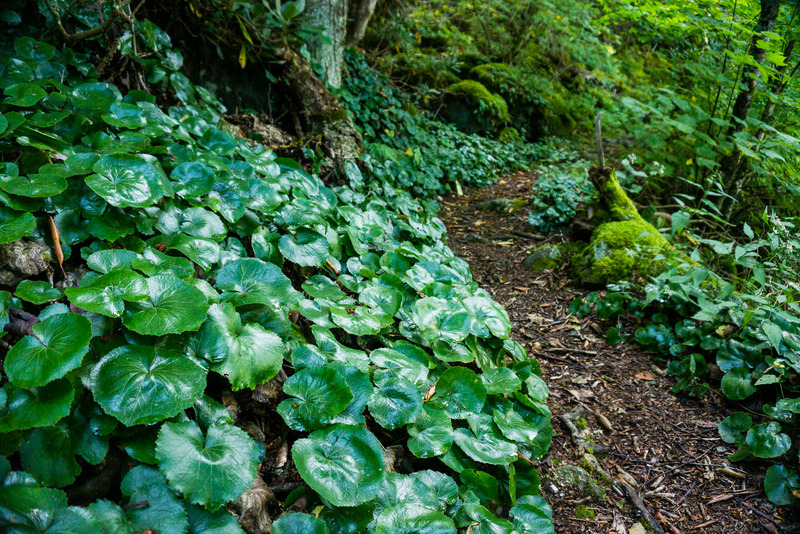 Patches of pungent-smelling Galax line the trail in places, too. 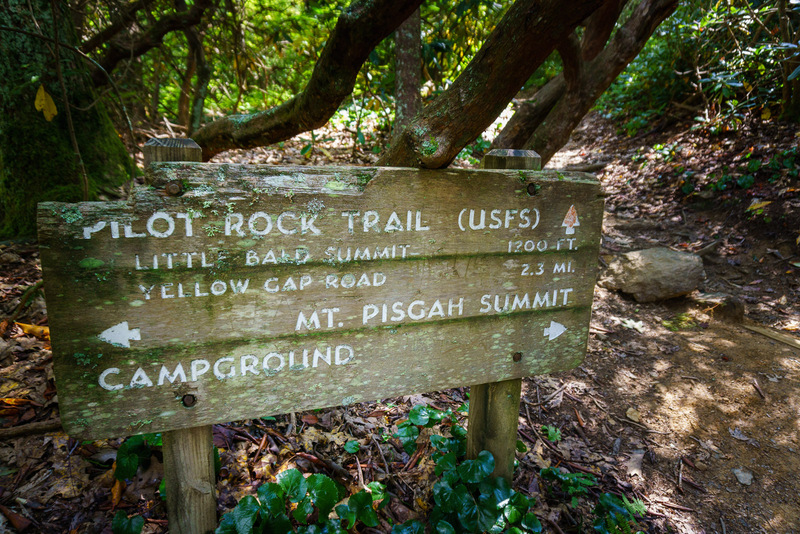 It’s beautiful, and even without the jaunt down Pilot Rock trail like we did, a loop from the Pisgah Inn that includes the upper part of Pilot Rock, the Laurel Mountain Connector, and Laurel Mountain would be highly recommended. 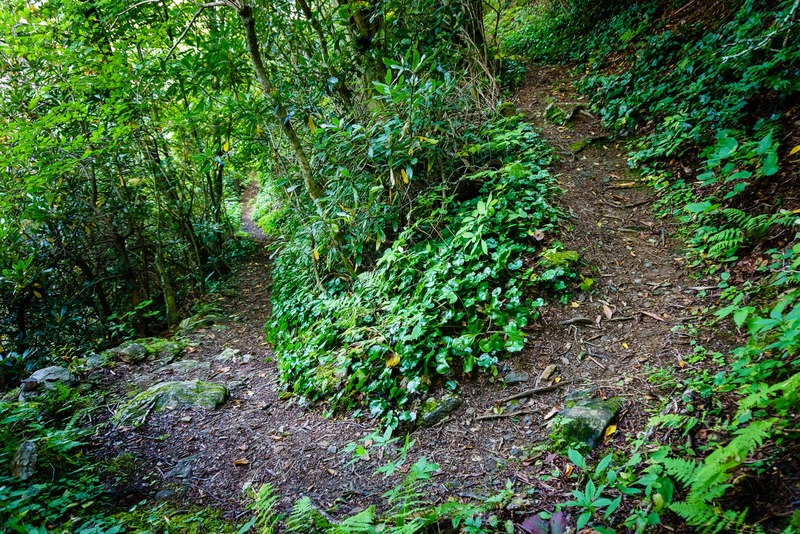 The trail climbs around a switchback and into a dark forest opening – it appears that very little sunlight reaches the forest floor here despite the lack of trees, thanks to its northerly aspect ratio. 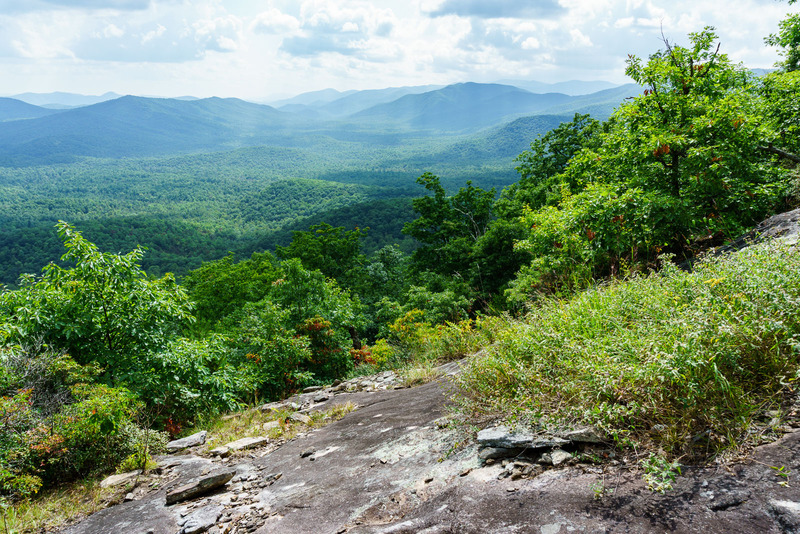 Before long, the trail wraps around the north side of Little Bald Mountain and starts gaining on the ridge where it will meet with the Mountains to Sea Trail once again. But not before passing a lush, green, wet spring branch, which on the day I hiked was making the most thirst-inducing bubbling sound I’ve heard water make. Luckily I still had plenty left in my pack, because otherwise I’d have taken a gulp – filter or none! After passing the spring, we encountered the first group of other hikers we’d seen since Pilot Rock, headed down to the spring to get some water. Then almost immediately we ran back into the Mountains to Sea Trail, and turned left. The directional signs at this junction are weathered, beaten, and lichen-covered. From that point, it was just a short uphill climb through the cool mixed hardwood/spruce forest, back to the Pilot Rock junction again, and then back downhill to the parking area to end our hike. But not before we passed through a rhododendron thicket sporting some very early signs of fall. And it’s a good thing the downhill was short, because for some reason my knees were acting up on the down sections. Other than a little knee ache, it was a perfect hike for a late summer afternoon!